Chris has been hard at work with other RYSE youth artists on the “Keep Families Together” Community Mural, in collaboration with the Richmond Art Center’s Califas: Art of the US-Mexico Borderlands exhibit. 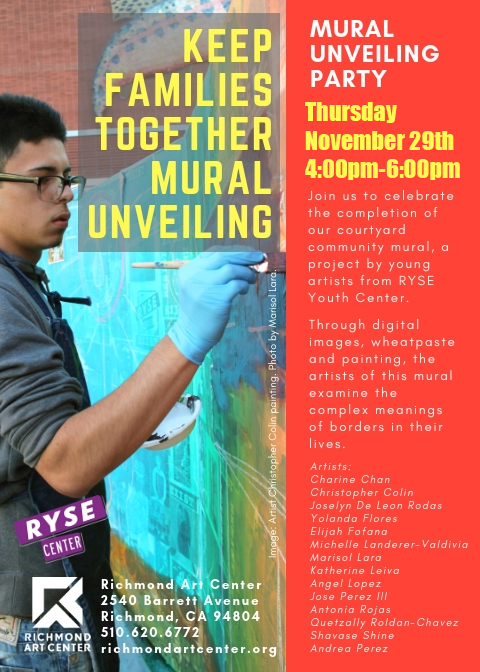 Join Chris and RYSE tomorrow evening at the Richmond art Center for the official mural unveiling! My name is Chris Colin. I am 16 years old, I attend Kennedy High School in Richmond, CA, and I’ve been a RYSE member for about 5-6 months. How did you hear about RYSE? I heard about RYSE through friends and family in my community. I got a chance to meet someone who works at RYSE who completely got me interested in the programs they have going on there all the time, his name is David. What is your favorite thing about RYSE? My favorite thing about RYSE is that there is always active staff there who always have activities going on. What have been some of your favorite programs at RYSE? My personal favorite programs are mostly art activities that help me improve on art skills. What’s something you do at RYSE that you are proud of? Always being myself. Accepting the help the RYSE provides me is what I’m proud of. RYSE makes me feel comfortable enough to be myself. You’ve been hard at work with Agana (RYSE’s Visual Arts Coordinator) on the “Keep Families Together” Community Mural, in collaboration with the Richmond Art Center’s Califas: Art of the US-Mexico Borderlands exhibit. Can you share a little bit about the mural, and your experience working on it? My experience working on the mural has been pretty awesome. It’s the first time I have been able to work on a mural with other artists for something that has a big impact on many people's lives. The idea of painting a mural that has to do with the connection between the US and Mexico Borderlands gave me an opportunity to express how this reflects on me and others through my art. I feel very open when working with Agana and the crew on this beautiful mural. I got a chance to learn some history based on Borders and some really important people in this world. RYSE in three words is Respectful, Caring, Chill and fun. Most people don’t know that RYSE is a positive and respectful environment and cares a lot about the youth. My idea of happiness is being positive and being stress free with your life.